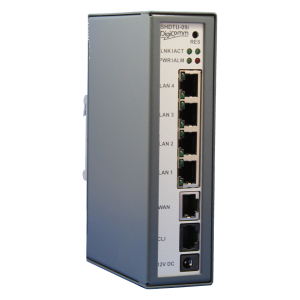 SHDTU-09-is Ethernet modem transmission technology allows ethernet networks to be connected via 2 or 4 wire copper cables with high speeds up to 15,3 Mbit/s / 30,6 Mbit/s. The modems adapt their speed automatically or manually to the quality of the copper line and provide trouble-free operation. When secure mode is switched on, stable data transmission is guaranteed over bad lines. Transmission length and speed rely Transmission length and speed rely on wire gauge, number of parallel G.SHDSL-lines and other confounders.On copper cables over distances of up to 25 km without repeater speeds of 320 Kbit/s are achieved. For longer distances other repeater solutions are available. The SHDTU-09-is units can also be run in daisy-chain and ring topology. This way you only need one unit per station (2-wire speed). On the G.SHDSL side, the modems adapt their speed automatically or manually to the quality of the copper line and provide trouble-free operation. They support topologies such as point-to-point or multi-point operation, line, bus and ring structures. When secure mode is switched on, stable data transmission is guaranteed over bad lines. Transmission and data security are key features of the SHDTU family. DIN-27001 requirements are met such as: port-based or tagged VLAN, management over proprietary VLAN, secure access via HTTPS & SSH, password protection, SNMP v3, switching off unused ports, port-based MAC or IP filters, syslog and time synchronisation. The route can be secured by VPN encryption and the modems can be employed as fully-fledged routers with firewall. There was a lot of emphasis placed on user-friendly modem operation. All settings for standard operation can be changed via HTTP / HTTPS via one page on the browser. The status page provides line quality information and also about potential device errors. The CLI interface allows the modem to be set up quickly. All configurations can be saved to external media for subsequent reuse. SHDTU modems are often used in applications where a high degree of transmission security and reliability is required, for example in utility supply applications such as electricity, water, gas, district heating, transport, etc. The robust modem design with its metal housing, top-hat DIN rail assembly, extended temperature range and redundant supply voltage of 12 – 72 VDC all make it suitable for use in harsh environments. 19” solutions are available centrally. SHDTU modems support all standard techniques and are compatible with all ATM/EFM-based G.SHDSL router / bridge systems. The transmission of my personal data is voluntary. I have the opportunity to withdraw my data at any time. My data is stored exclusively for the purpose of processing my request. A passing on to third does not take place.